In the 80s, he made arcade games for Atari. In the 10s, he led the team that made the PlayStation 4. Mark Cerny is old enough to have seen it all in the young medium of video games. For half an hour last month, we talked about a lot of it in a conversation that was as illuminating as it was, at times, surprisingly personal. Surveying pretty much the entire history of video games—and only occasionally slipping in some PS4 boosterism—Cerny struck me as shrewdly critical and ceaselessly optimistic about the four decades of gaming he's seen and about the years to come. We didn't talk much about the PS4, the system for which he was chief architect, nor about Knack, the PS4 launch game he helmed. He's talked about all that stuff before. I wanted to talk to him about gaming history—what he'd seen from back in the days when he was making arcade games such as Marble Madness, what he'd learned, what he hopes for. The results, as you'll see, in an interview full of details that are contrary to the conventional wisdom, one that hopefully offers a sense of a life well lived in the gaming industry. 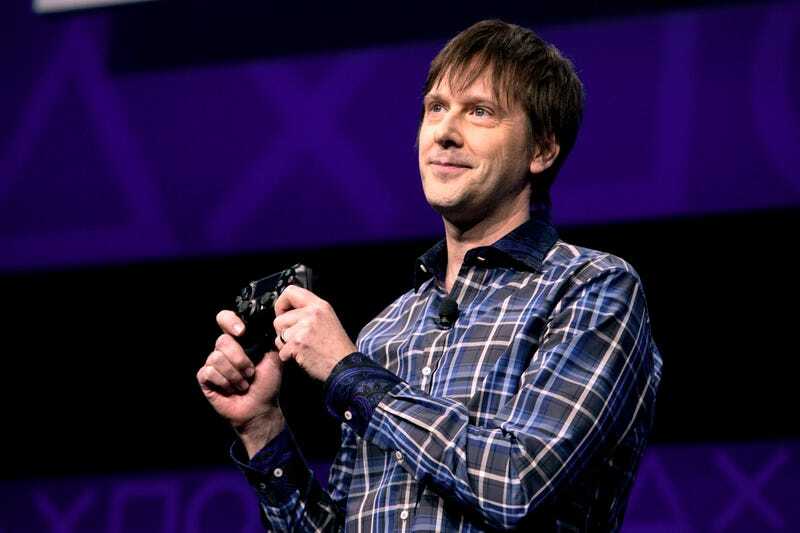 Cerny articulates a firm belief that advances in technology and game development tools only now are allowing gaming to flourish the way so many creators, Cerny included, have wanted them to for so long. Settle in, because I'd like to share with you one of the most interesting conversations I've had with a video game pioneer in quite some time. Cerny's been making video games for nearly as long as video games have been made. We started our conversation with a measure of his experience. Cerny: I've been in the industry for 32 years. I started in January of 1982 and the industry has been around for 42. If you look at it from the perspective of how you could be working as, say, a programmer and the like... 1976 is [when we had] the first programmers, because we didn't have CPUs originally. "I got [into the gaming industry] in 1982. So I got in by six years." The games from Pong all the way through Breakout were pure hardware creations. So you'd use digital logic on a board and make the ball move and do collisions on the hardware. So anybody who—sort of with my background—loved to play games and program [and] was trying to get in, the first year you could do that was 1976. And I got in in 1982. So I got in by six years." I wanted Cerny to tell me how the gaming industry had changed and, more curiously, how it hadn't. The constant that came to mind, it turned out, was that so little was constant. His career has embodied that sense of constant change, leading Cerny to some amazing achievements but also, I learned, some hard questions he's asked himself about what he hasn't achieved. Cerny: The thing I find so unique about games is the pace, the relentless pace of change where we in the business all have to reinvent ourselves every five years or so. Or find jobs somewhere else. And, to a certain extent, you could look at other media and say, 'Well, if you were a TV scheduling executive in 1982 you only had three clients, ABC, CBS and NBC, because they were barred from making their own programming. And obviously you couldn't keep that mindset in the current day where you have almost 1,000 channels out there. But i think even with that games have had more change in those 30-odd years. "We in the business all have to reinvent ourselves every five years or so. Or find jobs somewhere else." Kotaku: "Do you think of your own career in terms of changes and metamorphoses?" Cerny: "Definitely. I started out in arcades and pretty much, to keep working, I had to move to the console—well, consumer side of the business—because the arcade crash actually happened in the summer of 1982, six months after I joined Atari. Five rounds of layoffs and then, by the time I left, we had gone from sales which had been for a good title a little more than 30,000, by the time I left you were looking at 3,000 units. "I sometimes wonder if I wouldn't have been more successful if I'd stuck with something a bit longer, stuck with some aspect a bit longer." Kotaku: When you look over your career, does it feel like a logical progression? Cerny: No... Worked in the states, worked in Japan, programmer, designer, producer, executive producer, studio executive, president of a studio, and then hardware designer. Cerny: I sometimes wonder if I wouldn't have been more successful if I'd stuck with something a bit longer, stuck with some aspect a bit longer. Kotaku: But there's time to go back. You did that with Knack, right? Cerny: I enjoy doing multiple things at once, which is why I don't do that. It's not to say I didn't have a good year last year. But when I look out at the true greats of the business. Somebody like [Skyrim designer] Todd Howard, who I was talking to yesterday, I have not had that kind of track record. I have never created that level of product. So in my mind there's a very clear separation. Kotaku: It's a goal, though? Or does it not fit into that I-want-to-do-everything thing? Just one day before, I'd spoken to another veteran game designer, a guy who will be celebrating his 25th year in the gaming industry this year but is still a puppy compared to Cerny. Our conversation took an unexpected turn into the topic of the old PC-console gaming divide. Kotaku: I was talking to Tim Schafer about his lengthy career, and I asked him to take me back to gaming and what it was like when he started. One of the things he recalled was that it felt like gaming was going in a more serious direction then with computer simulation and stuff like that. Not in the amusement direction, so much. Cerny: What year was he thinking?" Kotaku: This is his 25th year. He was thinking mid-80s before Doom showed up. "When I went to the first [computer game developers conference], I was working to get Sonic the Hedgehog 2 out the door. Technically, I was the manager of the group, and when people would ask what I did I had to say I was between projects, because console games were held in such low esteem in those days." Cerny: Yeah, if you look at late-80s PC, you have serious products for adults like flight simulators and then you had these games for kids [on consoles] which were clearly inferior. And this is why the GDC was originally the CGDC, the computer game developers conference. As they felt at the time, anything interesting being done in games was being done on PC. And so, ironically, when I went to the first CGDC, I was working to get Sonic the Hedgehog 2 out the door. Technically, I was the manager of the group, and when people would ask what I did I had to say I was between projects, because console games were held in such low esteem in those days. Cerny worked and lived through the gaming crash of the early 80s, the one that is often blamed on a glut of bad games including the notorious, unsellable Atari 2600 rush-job E.T. But when the crash came up in our conversation, Cerny turned out to have an unconventional understanding of why the games industry crashed back then: simply, the technology of the time wasn't good enough to make good enough games to satisfy people's hunger for the medium. Kotaku: Since you precede Schafer, you remembered a time with Marble Madness or whatever else where games certainly were more of an amusement and in their heyday." Cerny: It was a bit faddy. It was a bit bubbly. You had theme songs. You remember Pac-Man Fever back in those days. We had our hula hoop moment—which was nice and it lasted for about five years and then it crashed hard. And I don't think it crashed hard because of the economics, which is what many people point a finger to or shovelware getting out there, I think it crashed hard because we didn't have the products—the experiences we were creating—to sustain that level of enthusiasm, long term." Kotaku: People point to E.T., a game that was not up to par. Is that what you mean? Cerny: "No. What would have been up to par? What could you have done in that space in 1982 that would have kept all of that enthusiasm going? The tools we used were so primitive, I don't even know that we could have done much. "I mean, just to put this... to give you an example: so I recently saw my code for Marble Madness, and it was devastating. It was sent to me very kindly by somebody who had rescued it from a dumpster, the day that Atari closed. A diehard fan had rescued all of this stuff and he sent it to me. And I'm looking at the code for running the [artificial intelligence] for one of the creatures in that game, and it was about 200 lines of incredibly simple C code. And then I looked around the office at Naughty Dog—I was sitting at Naughty Dog when I got this code—and they were making Uncharted 3. I went to one of the designers and said, 'That Lua script that you're writing right now for the enemy, how long is that?' 9,000 lines of much more sophisticated code. "What would have been up to par? What could you have done in that space in 1982 that would have kept all of that enthusiasm going?" What you're seeing there is just the incredible increase in sophistication in what we're able to accomplish due to how technology and tools have changed over the intervening 30 years. And I just think those limitations we had were so extreme—arcades, monetization limitations, technology limitations, that we just weren't going to be able to keep it going. Kotaku: It's interesting to hear you talk about that because, if you look at games now, particularly indie games, there's such a wave of nostalgia certainly for the aesthetics of earlier games, but you, having lived through all of it, have a great appreciation for what the advance of technology has enabled. Are you not as nostalgic for the older games, because you were aware of the limitations that bound those games? Cerny: They were very tough years. And, on the consumer side, the usability of the titles was very low. My respect for [Nintendo chief game designer] Shigeru Miyamoto derives from what he was doing with those primitive technologies...on the NES, but most everything else had really low play value. "When I joined Sega they had 40 titles. Three months to make a game... By my estimation, two of them were worth playing as a consumer... By the Genesis years, they were getting much better." Just to give an example from the Sega side, Sega got much, much better by the Genesis years, but for the Master System, the Mark III, they were making shovelware. They were convinced that they would be successful by making more titles than Nintendo. When I joined Sega they had 40 titles. Three months to make a game... By my estimation, two of them were worth playing as a consumer. I've been misquoted before as that being some slander against Sega, but, by the Genesis years, they were getting much better. They couldn't figure out how to take those really primitive tools and do an experience that would be worth spending time on. It wasn't surprising to me that Cerny was coming off as a technology guy. He's a programmer first and long been respected for that. What I hadn't appreciated until this conversation was just how strongly he believed that improvements in technology—and game-making tools—enabled better game design. Kotaku: When in your mind, in the progressions of gaming technology and design, did it get to the point where the technology was able to provide a proper experience for enough game designers or gamers? Do you see there as having been a tipping point? Or does that move as things get better and you recalibrate when the turning moment was? Cerny: I think it was easier creating for 16-bit than for 8-bit. And, unfortunately, after that we had such technological issues both going from 3D and digital media that once again with the early days of PlayStation, it was very hard for a lot of teams to make games with quality gameplay. They had a CD to fill and that was, what, 600MB, what do you do? And you had to have a 3D engine, and that was a bunch of issues that we never... well we had a few guys who had dealt with that from making flight sims and whatnot, but few of us had faced those issues before, so it was very hard. "[On the PlayStation] I think that many of the successes came from turning away [and deciding] 'We're not going to do the big pretty world and let's just pick a smaller concept.'" I think that many of the successes came from turning away [and deciding] 'We're not going to do the big pretty world and let's just pick a smaller concept.' Let's do Devil Dice, which is just not that hard technologically speaking. You just start thinking 'Virtual world = hard, what can I do that is easier?' How about 2D characters that you can... Parappa, right? And that also allowed the games that really did function in 3D, like Tomb Raider and Spyro the Dragon, to stand out. "I think we're in a great place now with [the fact that] creative directors don't need to think that much in terms of technology." Kotaku: Gaming has been around for 42 years. By your calculation do you think that in the next 42 there will be less tumult and that games will get to be more like cinema where the technology more or less stabilizes and the creativity is the thing that people can focus on? Cerny: We have a few more technology hurdles to get through here, and I think they're not about the hardware as they are about the tools that we use. If you look at the world of film, the camera is a known entity and you use the camera at different studios, from project to project. It's why transitioning to a digital camera is such a huge issue, because you have decades of expertise with this specific model. And if you look at this issue [in games] like 'Have we standardized on a camera? No and not only that but we don't even really have that conversation today. And yet these games are cinematic experiences. And so I think that the next decade or two will be as an industry working out what our crafts and our roles are across the entire industry. Kotaku: When you're talking about the camera in gaming, do you mean the camera in games? Or you mean the camera as a metaphor for the tools used? Cerny: I mean literally the camera. And what can you do with this camera? Anything at all. What are your controls. What we do is we code every brand that's made, code it up from scratch and each game takes this different approach. Cerny: I can foresee a day where somebody who is working in the design department of a developer can transition to working in the design department of another developer and still have very familiar toolset and can be productive. Cerny had seen the ups and downs of games being treated as a fad, as amusement, as art, as a serious medium. Some might say that he'd lived through gaming's identity crisis. His attitude seemed to be that gaming is finally figuring itself out. Kotaku: Given that we talked about your experience with games as sort of fads as amusements, those Computer Game Developer Conferences with the more serious-minded stuff, what's your sense of the potential of games? Have they shown through all this time that they are innately going to be amusement-oriented or that they have more expressive possibilities or what? Cerny: I think we felt we needed to prove something, that games as well could be emotional experiences. Why we felt we needed to prove that, I don't know. For me, many games have always been emotional experiences and that goes all the way back to the 80s and text adventures. Now, with getting true recognition with BAFTAs for writing and the like and having these stand-out narrative-driven titles like The Last of Us, I think we are finally past the point where we have to prove that. We can finally just relax and make these games and try to figure out what we want to do for this game. We don't need to aspire. "I think we felt we needed to prove something, that games as well could be emotional experiences. Why we felt we needed to prove that, I don't know. For me, many games have always been emotional experiences and that goes all the way back to the 80s." Cerny: It's still there. I feel it's fading out now. Kotaku: Why do you think that is? Cerny: Chris is something good to talk about in the sense that, in his mind, you are either making the true gameplay or you are making what he calls icing, which is something completely different, unrelated to the experience, and it costs money and it distracts you. As I look at games today it doesn't feel like we're dealing with the cake and the icing anymore. It feels like it's merged into a very integrated experience where it's working on a gameplay level and on a graphical level and on a narrative level at the same time. There's going to be a story [in a game] and it's going to be about a flawed hero, and it's going to be about somebody who doesn't think things through or, you know, in that tough situation will panic and the like. And to the extent that we have traditional narrative forms, where there is a story that the creative director made, this kind of hero works brilliantly. Because, in the story, you see the hero and the hero's journey. Once you say it's freeform and you're going to talk, you as the consumer need to go in there and say, 'I am a flawed hero, I'm going to panic when the going gets tough.' And it's just a very difficult—not only difficult design space but it puts expectations on the consumer by giving them that gigantic role in the narrative of the game. So I just wonder.. there is quite a lot of talk about open narrative. It seems that, for now, more constrained narrative is working very well. To make that a positive statement is really hard. Kotaku: I follow you, though. "I see that the [gaming] audience has now really matured." Cerny: "Another way to look at this is we are not making games in a vacuum. We are making games for the audience that wants to play games. We are making it in response to what sort of experience they'd like to have. As I was saying [on stage at the DICE conference] today, I see that the audience has now really matured. I don't recall there being a great audience 10 or 20 years ago for a game like Don't Starve, which is all about delayed gratification, a very intellectual approaches of play: what am I doing in this world? What are my goals? And all of those things. I'm so happy. We've got the same people on PlayStation 4 playing Call of Duty, Battlefield and FIFA who are also downloading and playing Don't Starve in massive quantities. Why does it work that way? Because the players really appreciate that intellectual challenge. Now, when you get to the narrative question and talking to the game system, I think you get into another challenge that the player needs to be actively interested in for that to work from both sides. You can't just say, 'Oh, sit down, here's a game you're going to control entirely with your voice and you will control the storyline. Right? You now need a lot of people who are interested in doing that. We'd talked a lot about how games and game-making had changed during Cerny's 32 years, but we hadn't talked about how gamers had changed. It would be our last major topic. Kotaku: I'm interested in that idea of the audience having matured and their tastes having changed. You've seen that. You must have seen that for decades. Cerny: I'm thinking back, and I am not really certain...Was that what it felt like to play Ultima? Back in the early 80s. No rules. You figured it out as you went along. I think the challenge we're presenting today is actually a bit trickier than that, but I can't be sure. Kotaku: But that game was a revelation, I think, in terms of what it was asking of the player. Cerny: Yes and that was fantastically successful and presented those challenges to people. Kotaku: You've seen the audience change and you would say, for the most part, evolve over the last several decades? It sounds like you have a sense that there are people in the world who want to play games and there are people who don't? Cerny: Actually, I think most people enjoy playing games. If you look at the set of people who have smartphones and the subset of them that play games on their smartphones, it is enormous. And games as a result have had explosive growth on tablets... Within that context, console gaming becomes a smaller portion and so it's very easy for the analysts to question if consoles have a role. Of course they do. It's a huge fanbase. It's just that the rest of the world is now coming in. Kotaku: What have you learned about gamers over all these years? Cerny: My start point was arcade games, and there you had to look at the consumer and their interaction with the product. That was the only way you made an arcade game that would be successful. They could see it for free, and they could try it for a quarter. And so I've really tried to keep an understanding of what sort of games people are interested in playing over the years. Because I know we are not working in a vacuum. We can't ask them what game are they interested in playing? You ask them and they'll say: 'Something like Grand Theft Auto V', right? Kotaku: The same as what they like. "The future we're heading for is the products are fluid and we're tweaking them on the fly, even in the console space." Cerny: Yes. But you do really need to think about the audience that you're trying to create the game for. Kotaku: And how do you figure that out? It's changed, right? Back in the day you could go to an arcade and quietly observe. Cerny: Right, so that's why we got going with playtesting in the 90s. We'd done focus testing. We transitioned to focus testing, which is now the norm. At some companies weekly playtesting is the norm. The future we're heading for is the products are fluid and we're tweaking them on the fly, even in the console space. Kotaku: Right. So even the act of playing them is also getting the consumer feedback to influence that game itself. Cerny: I don't know the exact statistics of how many of these consoles are connected but the connectivity is extraordinarily high so that fluidity of experience is certainly something that we will be working on. I figured we'd end with the assumption that a young Mark Cerny might be reading this interview—some kid with more than 32 years ahead of them in this industry. Kotaku: What advice do you have for young game creators? Cerny: Just get out there and do it. Making games is not something you need to go to school to find out how to do. I mean, it helps to hear about the theory of game design and to get some artistic education, but we are in an era where ...making a game is like writing a book, if you want to do it, you can do it. I think formal education plays a significant role today and I think it will play a significant role, but I think it's also important not to feel that one can't or shouldn't just go out and start. If you're interested in games, start creating commercial titles. As we finished our interview, got up from our chairs and began talking about how we both needed to get lunch, I needed to check Cerny's title, just to make sure I referred to him correctly. What should I say his role is these days? I assumed, given that he oversaw the creation of the PS4 console and was the main person introducing the machine at the system's February 2013 reveal event that he was a Sony employee of some sort these days. Nope. Cerny's answer to all this was, well, pure Mark Cerny. Cerny: I'm still Cerny Games. The hardware stuff is mostly done, some evangelism continues... I'm trying to get back to spending most of my time on games. Kotaku: But technically you're still at PlayStation, right? Cerny: It's Cerny Games. Everything I do is all one-offs. Kotaku: Oh. So for PS4, you weren't on staff? So, no. It's just, when I'm done with one, I obviously know a lot of people. Is there anything to work on?